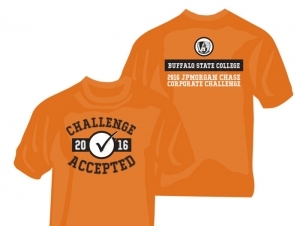 All Buffalo State faculty and staff are encouraged to participate in the JP Morgan Chase Corporate Challenge on Thursday, June 23, at 6:45 p.m. in Delaware Park. It is comprised of a 3.5-mile run (or walk) followed by party in the park that lasts until dusk. Register online no later than Monday, June 6. The challenge is benefiting the Say Yes Buffalo scholarship program. You don’t have to be an athlete to participate in the challenge. Runners, walkers, and race supporters are all welcome. The President’s Office, United University Professions (UUP), Professional Staff Caucus (PSC), Alumni Affairs, College Relations, and other constituents are supporting the Buffalo State College team. The $36 per-person fee includes a donation to the race’s charity, a Corporate Challenge T-shirt, a swag bag, a Buffalo State team T-shirt (pictured), and admission to the Buffalo State hospitality tent. Catered by Chartwells, the post-race celebration inside the tent includes hamburgers, barbecue chicken, veggie burgers, salad, fresh fruit, assorted desserts, bottled water, lemonade, iced tea, wine, and beer. Non-race participants (race supporters) must still register to join the hospitality tent. 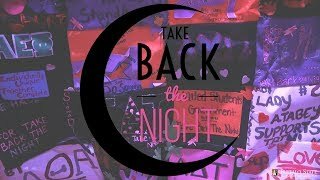 More than 11,000 Buffalonians take part in this annual event. During the 2015 challenge series, JPMorgan Chase & Co. donated more than $750,000 to not-for-profit organizations throughout the series cities, including Buffalo.